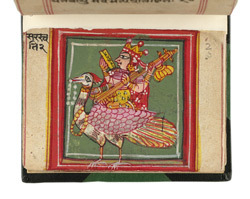 This image comes from a Book of Divination containing small paintings accompanied by verses describing the consequences, good or bad, of encountering the person or thing depicted. Each Sanskrit verse is followed by a version in Gujarati. The manuscript is written in Western Indian 'nagari' script with red and yellow ruled margins. Although undated, it was probably made in the late 18th or early 19th century.